How to reset reset oil service light Pontiac Aztek. With the ignition key in ON but the engine off. Press and release the accelerator pedal slowly 3 times within 5 seconds. If the CHANGE ENGINE OIL warning light comes back on on the display, the engine oil life monitor has not reset. All information how to reset oil service light Pontiac Aztek is taken owner’s manual. Turn the ignition to ON with the engine off. Press the MODE button until the Driver Information Center DIC reads OIL LIFE LEFT/HOLD SET TO RESET. Press and hold the SET button until 100% is displayed. You will hear three chimes and the CHANGE ENGINE OIL warning light will go off. If the CHANGE ENGINE OIL warning light comes back on, the system has not reset. 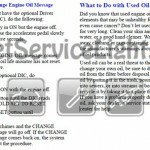 The full procedure how to reset oil service light Pontiac Aztek is taken owner’s manual. OIL LIFE LEFT HOLD SET TO RESET. This message displays the current percentage of the GM Oil Life System. Be careful not to reset this display other than when the oil has been changed. See above how to reset oil service light Pontiac Aztek. When to Change Engine Oil on a Pontiac Aztek. Your vehicle has a computer that lets you know when to change your engine oil. This is not based on mileage, but on engine revolutions and engine operating temperature. When the computer has calculated that the oil needs changing, the GM Oil Life System will indicate that a change is necessary. The mileage between oil and filter changes will vary depending on how you drive your vehicle — usually between 3,000 miles (5 000 km) and 10,000 miles (16 000 km) since your last oil and filter change. Under severe conditions, the system may come on before 3,000 miles (5 000 km). Never drive your vehicle more than 10,000 miles (16 000 km) or 12 months (whichever occurs first) without an oil change. The system won’t detect dust in the oil. So, if you drive in a dusty area, be sure to change your oil and filter every 3,000 miles (5 000 km) or sooner. 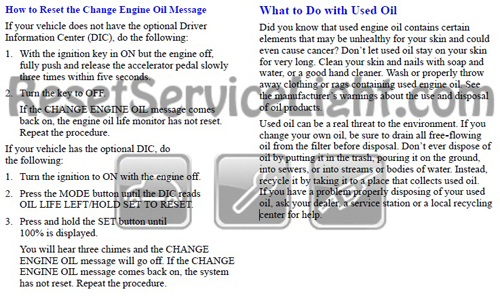 Remember to reset the CHANGE ENGINE OIL message whenever the oil is changed. Click here to see how to locate and replace your Pontiac Aztek cabin air filter. That it is the full procedure how to reset oil service light Pontiac Aztek. If you like to reset any maintenance oil light after an oil change. Or reset check engine light, airbag light, inspection key or insp errors when maint reqd, for Pontiac cars. Or any warning light for service reminder which appears on the display. Write in the search box the car name for which you want to find information, and find how to reset other service reminders by yourself.